3-5 December, 2012 the annual World Stem Cell Summit, the global stem cell and regenerative medicine community’s flagship event was held. It is the largest interdisciplinary, networking meeting of stem cell stakeholders, uniting the diverse regenerative medicine community. With the overarching purpose of fostering biomedical research, funding and investments targeting cures, the Summit is the single conference charting the future of this burgeoning field. Summit speakers have been featured on the national stage over the past few weeks. Paolo Macchiarini of the Karolinska Institute (who held plenary lecture “Stem-Cell Based Organ Replacement and Cell Therapy”), was featured in the New York Times for completing the first “bioartificial” organ transplant of its kind. Susan Solomon of the New York Stem Cell Foundation has received more than 17,000 hits for her TED Talk, "Realizing the Promise of Stem Cell Research," and George Daley of Children's Hospital Boston and Harvard University was interviewed on NPR for a story entitled, "Scientists Create Fertile Eggs From Mouse Stem Cells". Read more about some of our featured speakers here. The program of the Summit provided the research, industry, economic and societal context for understanding how all of the pieces of the stem cell puzzle fit together. More than 150 speakers participated in the conference and 50 hours of in-depth presentations were done. 2012 Disease focuses included: Caner, Diabetes; HIV / AIDS; Cardiovascular; Spinal Cord Injury, Paralysis, Parkinson's and other Neurological Diseases; Diseases of the Eye and a few others. In addition to compelling keynotes and panel discussions, the diverse three-day program included Expert Lunch roundtables; an Exhibit Hall; the Poster Forum showcasing science and policy research; the gala Stem Cell Action Awards Dinner; as well as many networking and partnering opportunities. Poster Forum candidates included scientists and researchers; representatives of industry; stem cell research funding organizations and economic development officials; members of Institutional Review Boards and Stem Cell Research Oversight Committees; patient advocacy organizations, patients, and representatives of related not-for-profit organizations; government agencies related to public health and their counterparts from around the globe; representatives from the insurance and finance industries; professors and students of medicine, physiology, biology, other relevant sciences, ethics, law, and other disciplines related to social implications; and practicing professionals. The winners of the World Stem Cell Summit Poster Prize were announced by Alan Jakimo, Senior Counsel, Sidley Austin. Three winners were selected in the category of Science, Technology, and Industry; one winner in the category of Advocacy, Education, and Public Engagement; and one winner for the Student Prize for the most creative or innovative poster coming from a high school or undergraduate college student. Winners will have the opportunity to publish their research in Regenerative Medicine journal. 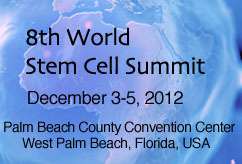 The first place overall winner will receive a choice of free registration to the 2013 World Stem Cell Summit or $500; second and third place winners will receive $250; fourth and fifth place winners will receive $100. After the prizes were announced, Jakimo said, "Posters at conferences in any field are like new therapies in healthcare - a sign of hope. Based on the posters at this year's Summit, we have much about which to be hopeful."